Ever wanted to use your phone while you were charging it? People frequently use their phone or tablet while they are charging it. The electrical outlet is hardly ever in a convenient position, and you probably know what it's like to sit in an awkward position because your cord isn't long enough. 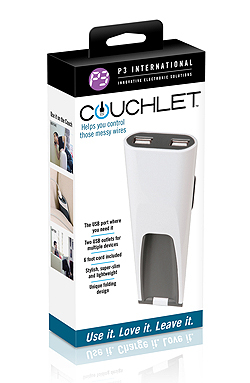 Presenting the USB Couchlet™, the USB port that is exactly where you need it. The Couchlet''s wedge-shaped design means that it fits between or under cushions and mattresses so that you can barely even see it. The fold out leg gives you extra stability and the ability to slide the Couchlet onto the outside of your furniture. 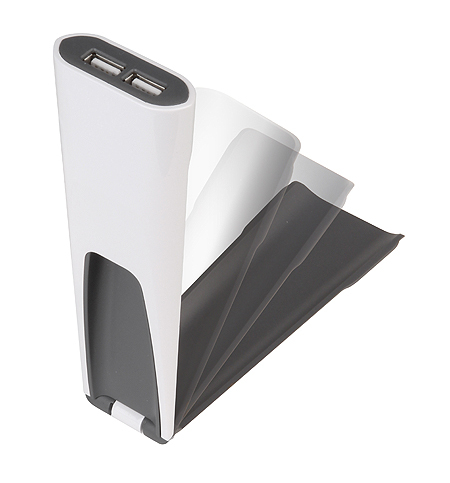 Each Couchlet comes with a detachable 6-foot USB cable that uses your current wall charger for power. The Couchlet is low voltage, so it's just as safe as the charging cord that comes with your phone. Wedge the Couchlet between couch cushions or next to the armrest. Use the folding elbow if you need extra stability, but most cushions hold the Couchlet nice and tight.